About thirty-five people attended the SA Rebel Films screening of the Ken Loach film “Spirit of ’45” at OISE U of Toronto on October 4. Most stayed for a lively discussion on the origins and present threats to the welfare state, and the need for socialist transformation of society. Below is the text of the presentation I made on the subject, following the screening. The outstanding English film and television director, Ken Loach, was born in June 1936. He is known for his naturalistic, social realist directing style and for his socialist politics, which are evident in his film treatment of social issues such as homelessness (Cathy Come Home) and labour rights (Riff-Raff and The Navigators). Hidden Agenda (1990). Cannes Special Jury Prize. Raining Stones (1993). Cannes Special Jury Prize. The film shows the contrast between the poverty of the 1930s and the hopes and aspirations of the working class that there should be no return to these conditions. One contributor from Liverpool described his living conditions before the war, with all the children getting into a bed every night which was crawling with vermin. The happiest moment in his life was moving into a new council house. With the 50% increase in homeless families now and the attacks on housing benefits, it shows why the mass house building programme following the war was so important. In Wales some of the temporary accommodation, the prefabs, are still being used. Tony Mulhearn, one of the Liverpool 47 councillors who stood up to the Thatcher government, was one of the film’s interviewees. He said what politicians should be doing now to improve working class people’s lives. Liverpool city council in the 80s showed that the Spirit of ’45 was not a distant historical event but an example of what working class people can achieve, tangibly with bricks and mortar, when we fight together. The film does not fully convey a sense of the mass revolutionary wave involving demobilized soldiers who were determined that after defeating fascism they should build a better world free from squalor and poverty. The 1945 Labour government was elected on a wave of confidence and pushed much further to the left than politicians expected. The ruling class was terrified that workers would take power in Britain and fundamentally change society. So the rulers conceded unprecedented reforms: the nationalisation of gas, electricity, coal and transport and the creation of the NHS. All these made a massive difference to people’s lives and showed the advantage and logic of providing services, utilities and transport planned on a nationwide basis. The creation of the welfare state and nationalisation at a time when Britain was bankrupt shows what can be done now to stop all the cuts and invest in jobs and services. The ruling class can always find money when it is necessary to protect their system. The film clearly shows the limitations of the way the nationalisation was done, imposing tyrannical bosses and with no workers’ control. There were also concessions made to create the NHS, leaving private healthcare in place and “stuffing the consultants’ mouths with gold”. The creation of the welfare state was a big step forward, but only a glimpse of what could be achieved with workers’ control of society. The film exposes the current lack of a mass political alternative standing up for the working class. It lets the audience draw the conclusion that a new political voice is needed. Loach was very clear in the discussions after the screenings that a new political formation representing the working class is needed, and that unions should stop funding New Labour. Unlike nearly all other film directors, Ken is not just a film maker. He is somebody who intervenes regularly in the political debate and supports real struggles. His only rival might be Michael Moore, but with all due respect, the latter’s politics are less developed. Many filmmakers make films with progressive messages that inspire people to think critically about the world, but they usually keep far away from the messy world of politics. Apart from anything else such engagement can make their next film’s funding problematic. For this film Loach obviously worked in a collaborative way with many experienced political activists’ nearly all of whom are clearly to the left of New Labour. With them he developed an articulated campaign for getting the biggest possible reaction to the movie. He created a brilliant website packed with educational material that is understandable and accessible to the general public, students, teachers and activists. His media promotion was successful with appearances on Question Time, Newsnight, Morning TV and radio as well as the Evening Standard. Then there was the launch in 40 cinemas with a live Q and A session. He put himself forward as a promoter of the campaign for the June 22nd People’s Assembly against Austerity which is almost a political sequel to the film. He encouraged people to distribute material at all the screenings. Finally he made a public appeal for a new Left Party which 2000 people signed up to join after one week. Although this call is not crudely put into the film, it is a logical conclusion to the points made by most of the participants. The film is also politically astute in the way it reaches out to people who have different judgements on the utility of the current Labour party. It is the opposite of sectarian. It could easily have shown more explicitly how the whole way in which the welfare state was set up was a classic example of the limits of bureaucratic social democracy, that the rule of capital was shaken a little but not really challenged, indeed that capitalism itself benefited from the planned rebuilding of the infrastructure in those years. He could also have explained in more detail how the lack of independent working class self-organisation meant the welfare state was never really owned or run by working people. Consequently, given the difficult economic conditions, it was easy for the Tories to return in the next general election, since the Labour government was identified with the continued rationing, a certain bureaucratic authoritarianism, and with austerity. Yet that would have been a different film for a different purpose or period. Today many of the fortresses of the labour movement have been dismantled through deindustrialisation and defeat. Union membership is half what it was in the 1970s and we know what happened to the Labour Party. In many ways this is a rebuilding phase of the labour movement. A large part of the population is unaware of the significance of the founding of the Welfare state. People under the age of 40 cannot even remember when electricity, gas, coal, rail, iron and steel, road haulage, telephones and so on were publicly owned. Several generations have been raised on the Thatcher and Blairite ideology that public sector equals wasteful and inefficient, and the private market and the entrepreneur are effective and dynamic. The current crisis is shredding some of those illusions, but vivid lessons from history put some flesh on a possible alternative. People need to grasp the fundamental difference between the Spirit of ’45 and the neo-liberal ideology and offensive led by Thatcher, and continued by Blair. So this is the right film for now. Indeed the strength of the film is the way it shows how government policies and projects such as the NHS or house building go to the heart of people’s lives to health, shelter, security. Key statements about the reforms are interspersed with wonderfully edited interviews with working people who explain how they slept five to a flea-ridden bed, or how profit in the mines led workers not to shore up the tunnels resulting in needless deaths. A doctor recounts how after the formation of the NHS the women he was visiting still could not understand that he would be able to see the other member of her family who was ill because it was now all free of charge. A South Wales miner movingly talks of the death of his mother in childbirth through lack of care. Anger, hope and celebration are all there, but also some bitterness is expressed at the limits of the change where, for example, the brutal private coal managers are recycled into the leadership of the National Coal Board. The visual documentary evidence came from old newsreels and official government film extracts which were edited together in a fresh way and included some elements most people have not seen, such as Churchill being booed at an open air meeting by Labour supporters. Interestingly, many of the key official propaganda wartime films were made by Communist Party or Left Labour people working in that unit. There was little local mobilisation for the Welfare state changes in terms of committees or workers organising in those sectors. However the officially sanctioned civics meetings organised in the armed forces in the final year of the war, and while people were waiting for demobilisation, did provide an opportunity for mass political debate. Left-leaning servicemen often pushed the discussion on support for no return to the 1930s and the need to win the peace with social improvements. An example is shown in the film. Keep in mind that the 50,000 strong Communist Party was at its height at this stage and worked to push Labour to the left. Russia retained a certain prestige among workers and reinforced popular support for the social efficiency of planning. People also linked victory over the Nazis to the government direction of the economy and of rationing. So the film shows the material underpinning of the Spirit of 45 that working together and planning could bring results. There was a temporary coalescence between a sense of nationalism and socially progressive measures. Of course nationalism in an imperialist state has a deeply corrosive effect, and the horrid crimes of Stalinism utterly destroyed the Communist Party. Overlaid on the images from time to time were quotes from Labour party manifestos or its programme. These statements could easily be rallying calls for the struggle against austerity today. But Labour has long since abandoned such positions. Under Blair it deleted Clause 4, its pledge to being a socialist party that aims to socialize the means of production. A final component of the film is the analysis made by writers, historians, economists and veteran workers’ movement activists such as John Rees, James Meadway, Ralphie Dos Santos, Dot Gibson, Alan Thornett and Tony Richardson. This allowed Loach to connect the historical story to the current crisis and to possible political alternatives. Otherwise the documentary could have become an exercise in nostalgia. 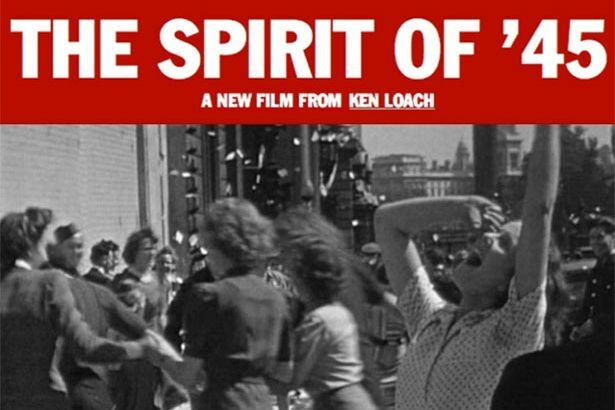 Ken Loach has regularly managed to produce works of art for TV or the cinema which are engaging narratives. However, unlike most film directors, he expresses working class lives and struggles in an unsentimental but positive way. What about the Labour Party today? But how believable are those promises in light of New Labour’s sins, including bank deregulation and privatization, and waging illegal wars? Take into consideration the speech to convention of Ed Balls, Labour’s shadow finance minister. It was reminiscent of classic Gordon Brown, from his pledge to use a higher bank levy to fund childcare to his ‘iron’ commitments to match George Osborne’s 2015-2016 current spending limits. Balls even promised to use the proceeds from selling RBS and Lloyds to pay down debt, in other words, privatizing banks to appease bond markets. But that wasn’t the mood of Labour’s delegates. They gave a standing ovation to Unite leader Len McCluskey when he called on the party to stand up for organized labour, and they voted overwhelmingly for the lifting of the public sector pay cap. Balls and Milliband support the cap on wages. The Labour Party voted to re-nationalize the railways, and if it’s sold, to re-nationalize the postal service. But party leaders said, “That’s not our policy”. Have we seen this kind of behaviour in the New Democratic Party? A disregard by leaders for adopted policy? Violation of party principles and trampling of the interests of the working class? Have we seen efforts to remove all references to socialism, and to distance the party from the unions? Interference from the top in the local candidate selection process? We have seen all these things, and more. The difference in Canada is two-fold: 1. the NDP has never formed a federal government, and 2. unlike in Britain and Europe, the forces to the left of the NDP in Canada are miniscule and incapable of forming a significant revolutionary party. But what we have in common is this. We have a capitalism in decline, an ongoing global economic and environmental crisis, and both the need and the opportunity to advance a compelling socialist alternative. The “caring capitalism” that Milliband and Ed Broadbent propose is like the Arabian phoenix. It has never been seen. And it never will be. The system that puts profits before people must go, root and branch. A great way in Canada to advance the socialist alternative is to join the NDP Socialist Caucus. The SC has a higher media profile than does the rest of the left combined. The SC has chalked up wins. The SC won the NDP to a ‘Canada Out of Afghanistan’ policy. It helped to generate a major debate in the NDP on public funding of Catholic schools. It prevented the complete removal of socialism from the party constitution. It won support for Quebec students and the fight for free post-secondary education. It helped Linda McQuaig to win the NDP nomination in Toronto Centre. And an even better way to advance a democratic and socialist future is to join Socialist Action. No organization is more active, every day of the year, in fighting for union democracy, against labour concessions, against poverty and war, for women’s and LGBT liberation, and for a cooperative commonwealth. A good time to join us is tonight.